Samson is a 2 year old neteured male. Samson came into rescue due to the older resident dog taking a disliking to him, he spent alot of time outside and his owners felt this was unfair. Samson also had 18 lumps along his back end which looked suspiciously like Mast Cell Tumours. He was thin, lacking muscle and extremely itchy. Samson was taken into foster with his Aunty Kirsteen whilst funds were raised to have the lumps biopsied. 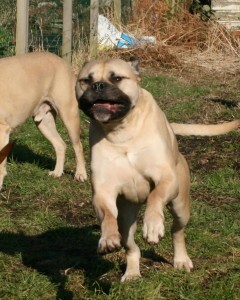 Thankfully Samson’s results were good, his lumps were not MCT’s but due to food allergies. Samson was then moved into foster with Kerry and started on a raw diet to see if this would improve his skin condition. Samson’s skin and lumps improved dramatically over a period of a month, the itching stopped, the lumps slowly disappeared and his fur looked much healthier. Needless to say Samson stayed with Kerry, Shane and the rest of the Staxonoby crew, they couldn’t bear to be without him. He now has 4 doggy friends who he adores, he loves his walks and devours his food. 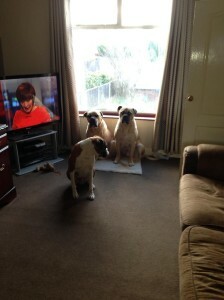 Thanks and praise must be given to the many many people who donated to Sammy’s vet fee’s, especially to the girls of Boxer Dog Rescue Northern England who pushed Sammy’s cause to get him out of his situation. A huge thank you must also be given to Kirsteen Peel his foster mum, Louise Baggley of Home Counties Boxer Welfare and Trish McHugh of Boxer Dog Rescue Northern England for initially assessing Sammy, Kirsteen’s vet for taking such good care of Sammy. It was fantastic to have 3 rescue’s work together for the sake of the dogs. Thank you all so much.